With over 25 #1 radio singles and multiple Grammy nominations over the past 11 years as an artist, producer and mixing engineer, Darren Rahn has become urban jazz’s premiere sonic architect, the “go-to” guy for established genre greats and up and comers looking for their next sure-fire hit. 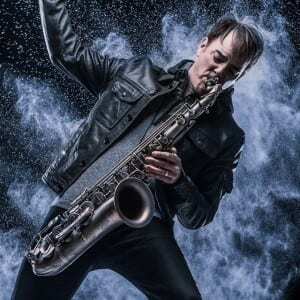 Yet in signing with Woodward Avenue Records and recording his fifth album, the British Columbia born, Denver based saxophonist – who launched his solo career with Soulful in 2004 – is after something more meaningful than a few more instantly infectious smashes. The multi-talented performer’s desire to launch his second decade as an innovative powerhouse by creating music in his truest voice, straight from the heart, is perfectly in line with the label’s unique mission: to let artists make music authentic to themselves, beyond the trappings of formulas and strictly commercial considerations. Another unique element is the decision to go with all live drums, as opposed to his previous trademark mix of live and computer generated grooves, in addition to instruments like the Hammond B-3 organ and Bosendorfer piano. Because the project is about much more than simply creating ten new potential singles for radio, he is also composing some longer tunes, and ones that explore his equal passions for pop, rock and R&B/funk – as well as his lifelong affinity for the gospel music he grew up playing. Rahn’s desire to keep things as organic and raw as possible has lead to a bona fide, expansive jazz fusion track on the new album. Rahn, who launched his career producing, engineering and mixing for local Denver area artists starting in the late 90s, began working with Tisdale after Rendezvous Music, an independent label co-owned by Dave Koz, showed interest in signing him. While the label couldn’t commit to adding Rahn to their roster, they were so impressed with his production that they offered to have helm a track for Tisdale, one of their top artists. In 2004, just as his own solo career was gaining steam, Rahn produced the bassist’s hit cover of “Ain’t No Stoppin’ Us Now”; it was in the pole position on the airplay charts for four weeks and stayed in the Top 10 for nearly eight months. His subsequent production work on Tisdale’s Way Up! project resulted in a #1 Billboard Contemporary Jazz Album. He has garnered Grammy nominations for his work as a producer, composer, mix engineer, and session musician for other artists including two Grammy nominated Dave Koz projects: Hello Tomorrow and Summer Horns. Rahn’s dual paths as an artist and producer reached a unique pinnacle in 2008-2009, when his own single “Talk of the Town” hit #1 on the Billboard jazz chart (followed by the Top 5 track “What Cha Gonna Do For Me”) and he scored three consecutive #1 productions (14 weeks in all) on the Radio & Records smooth jazz chart, holding the top position with Koz, Eric Darius and Tim Bowman. During this time, Rahn held the top three chart positions for several weeks and had as many as four songs in the Top Ten at the same time. Over the years, as his detail-oriented sonic excellence led to more and more hit recordings, his resume has grown to include everyone from Toby Keith, Jonathan Butler and Najee to Bob James, Kirk Whalum, Jeffrey Osborne, Phil Perry, Jeff Lorber, Norman Brown, Jonathan Fritzen, Scott Allman, Julian Vaughn, Nick Colionne, Lebron, Dave Bradshaw, Jr., Patrick Lamb, Ryan Montano and many others. Growing up on a farm in in a small British Columbia mountain town and later in San Diego, Rahn’s formative musical experiences – and the foundation of his later passion for jazz and other genres – came from playing gospel music. In addition to performing at his home churches, he toured around with his parents’ singing group. Throughout his journey, he played everything from traditional hymns to mainstream Southern gospel tunes. After playing jazz in both junior high and high school, he studied music as an undergraduate at Adams State University, then earned his master’s and part of his Doctorate at the University of Northern Colorado in classical saxophone and jazz pedagogy. Settling in Denver, Rahn by 1997 was self-employed as a freelance producer, writing his own material on the side as he worked towards his eventual emergence as a solo artist.